WHAT do plastic bags and steam locomotives have in common? The new 17- and 32-ton travelling cranes loom large over Riley & Sons’ first dedicated boiler shop. The upturned boiler of ‘King’ No. 6024 King Edward I stands to the left, and the tender tank that will be used behind No. 34046 Braunton is to the right. Answer? An industrial building near Rochdale that once served the big chain supermarkets and is now helping to put the ‘steam’ into preserved railways and the main line. 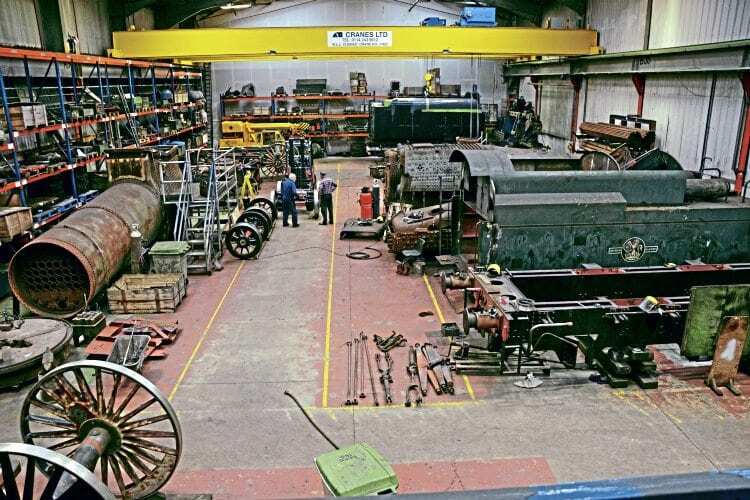 The unassuming-looking structure at the ‘top end’ of Sefton Street is the new, fully equipped home of Riley & Son (E) Ltd, and has been rapidly filled with machinery and locomotive components since its relocation from Bury. Famed for the pivotal role in rebuilding the National Railway Museum’s ‘A3’ No. 60103 Flying Scotsman, the business is now focusing on other major projects, if not quite so glamorous or high-profile, at its new home on the edge of the brooding Pennine hills.